Wendy Kromer Confections understands there are times you need just a simple, delicious cake for a small dinner party; and then there are times when you are celebrating an Anniversary, a Birthday, an Engagement, or the arrival of a new baby, requiring a perfectly designed cake or cookies. 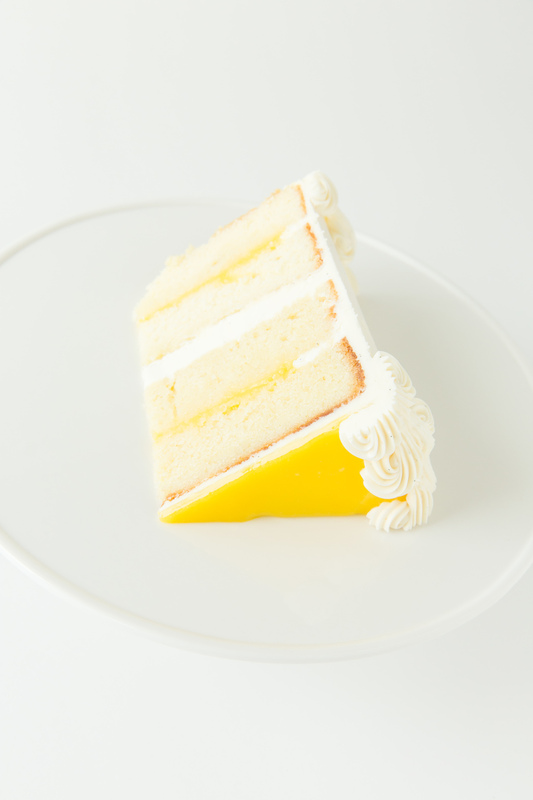 -Light Lemon Cake - White Butter Cake layers filled with 1 layer of Lemon Curd & 2 layers of Vanilla Buttercream. This cake is then neatly frosted with more Vanilla Buttercream, then topped with another thin layer of Lemon Curd. -Red Velvet Cake - Classic Red Velvet Cake layers filled & frosted with Vanilla Buttercream, and topped with a few fresh Raspberries. -Vanilla & Raspberry Cake - Vanilla Cake layers filled with housemade Raspberry Preserves & Vanilla Buttercream, then topped with a Raspberry Buttercream fleurish. - Chocolate Stout Cake - Chocolate Cake layers infused with Stout, filled with Chocolate Buttercream, the coated with Chocolate Ganache. 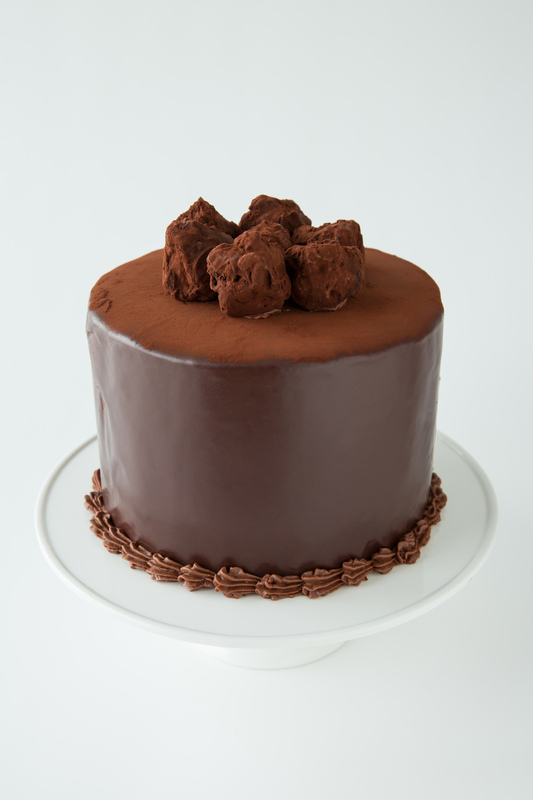 Chocolate Stout Cake Truffles top this layer cake....in case you still need a little "chocolate"! For unique, custom cakes for Birthdays, Anniversaries, Bridal Showers, Baby Showers or other small celebrations, our minimum price starts at $150. Actual pricing is determined by the of amount labor involved in handcrafting the decorations. Oftentimes, custom orders take anywhere from 6-20 hours to create, so if you would like us to create a unique cake for your small, but very special party, we are happy to give a quick estimate, based on the amount of time we will spend creating it. Wendy Kromer Confections is also well known for handcrafting custom cookies & cupcakes. Custom designed cookies may be decorated with royal icing, rolled fondant and/or edible images. We then slip each cookie into a cello bag which is then tied neatly with a satin or grosgrain ribbon. Most of our cookies range, between $4-$12 each. Cupcakes start at $2.85 each. You have the option of keeping them sweet & simple, or Wendy can dress them up further with made-to-order, fondant decorations or more elaborately piped buttercream details. Each cupcake is then nestled in a color coordinated cupcake wrap, at no extra charge. All custom orders require some lead time. We will do our best to fit small, last minute order requests into our schedule however, during peak Wedding Season or the Holidays, it is best to place your order 1 week to 1 month in advance. For all custom orders, please contact us!